OK so I used Simon Says new Wide Striped Background stamp and this really fun stuff called Goosebumps. Its a milky colored liquid in a bottle that goes on wet and dries clear. It comes in a spray or a dauber top bottle. I used the dauber to create this look. I covered the top of the stamp with Goosebumps and then blotted it a little to get the worn look, then stamped right onto the paper. I quickly washed my stamp because it dries pretty fast and I didn't want it to ruin the stamp. I took Seedless Preserves and Shabby Shutters (even though it doesn't look that green) and blended all of the front of the card. Then I took a soft towel and cleaned the lines of the striped image to take more ink off and that is the look I got! I added in a sentiment from the Handwritten Border set from Simon, as well. Then I die cut 2 stars in vellum and hand stitched them tot he front of the card. Off to the gym! Thanks for stopping in! 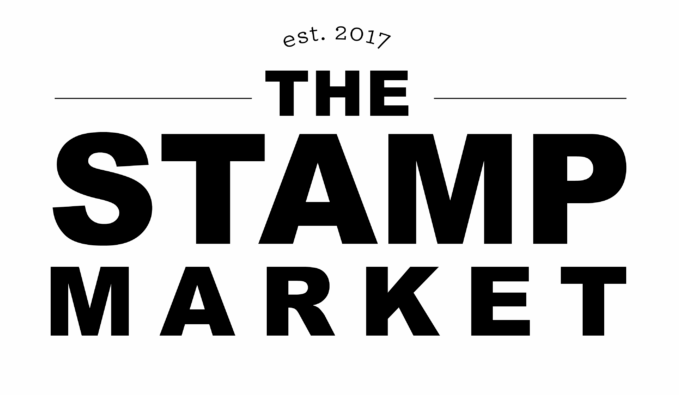 That wide stamp just arrived on my doorstep this week, and I love what you've done with it! Perfect, just the way it is! 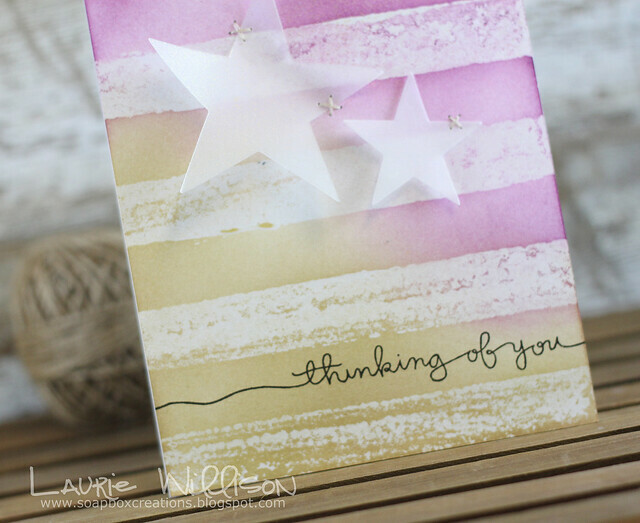 Pretty stars and stripes Laurie! Somehow I still knew it was you! Love the vellum with the little stitches! Very cool card, Laurie! 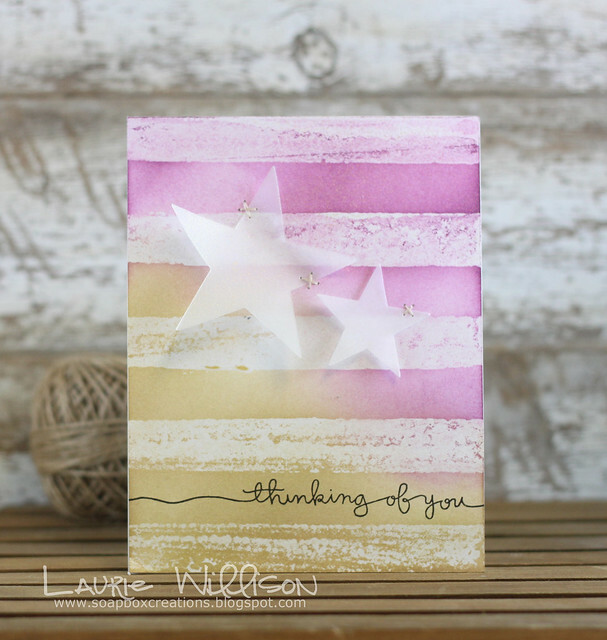 Love the vellum stars with the little stitches! Awesome! 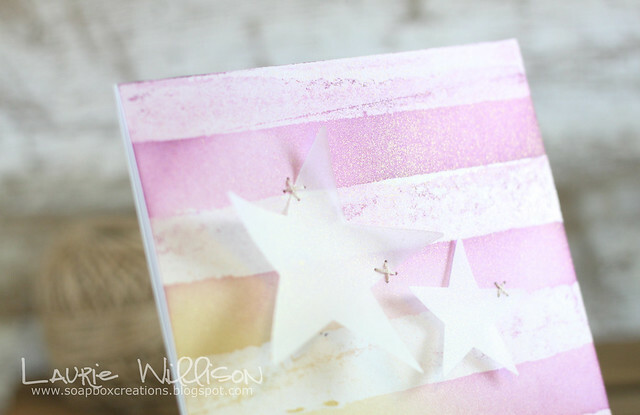 Love the rustic yet modern feel to this card, and love how you attached the stars! 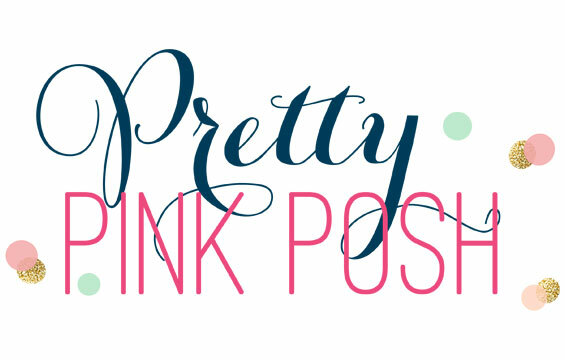 That wide stripe stamp is so versatile I have seen it used at least 20 different ways but this is my favorite so far it reminds me of an antique sign where some of the paint has peeled in certain spots this technique sounds like fun I may have to give this product a try! I love this! I need to get this stamp! this is so very cool! Clearly I need to add the Goosebumps stuff to my stash because this effect is amazing. I love how you blended your inks. Just gorgeous! I might need to get goosebumps! 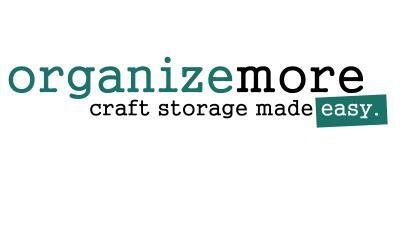 Nope, it's awesome! I usually get a cool background created and then get stumped on how to finish it off. I like your idea of vellum shapes.